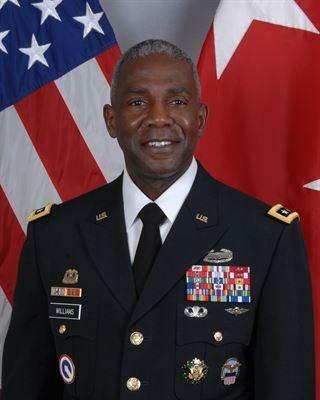 HAMPTON, Va. (April 18, 2019) — Hampton University is pleased to announce that alumnus Darrell K. Williams ’84, a three-star Lieutenant General in the United States Army and Hampton alumnus, will serve as the University’s 149th Commencement speaker on May 12, 2019. Commencement will be held at Armstrong Stadium at 10 a.m.
Williams, a native of West Palm Beach, Fla., earned his bachelor’s degree in psychology at Hampton, where he was a Distinguished Military Graduate of the ROTC Program. He was commissioned into the Army Quartermaster Corps in 1983. During his Army career, he graduated from the Army Command and General Staff College as well as the School of Advanced Military Studies. Williams is also a Distinguished Graduate of the National War College. He holds master’s degrees in military arts and sciences, national security and strategic studies, and business management (logistics).